Later this year I’ll be making my sister’s wedding cake. She wants one of the layers to be a chocolate biscuit cake, so, as a trial run, I decided to make a couple of the layers of her 30th birthday cake as chocolate biscuit cake. I wanted to try two very different recipes to see how they tasted and how easy they were to marzipan and ice. 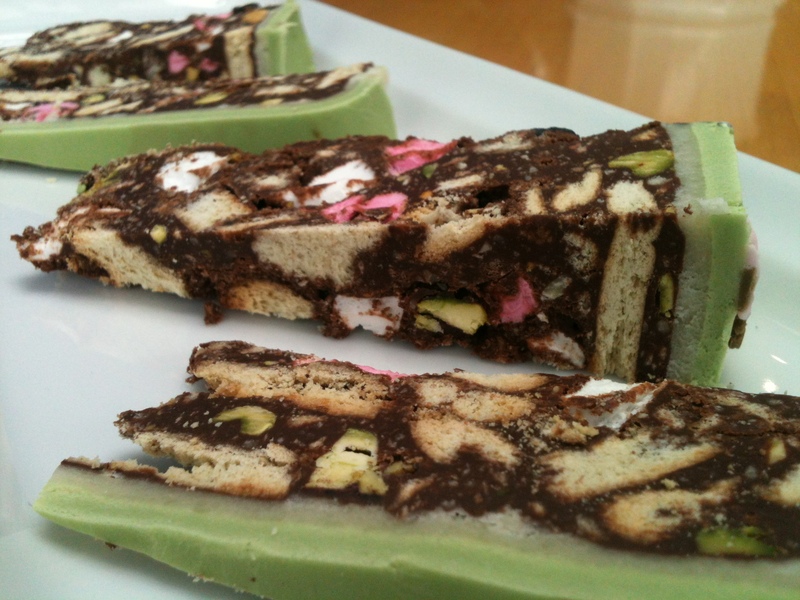 My mum made the top layer – it was a very rich, fruity, and slightly alcoholic chocolate biscuit cake. 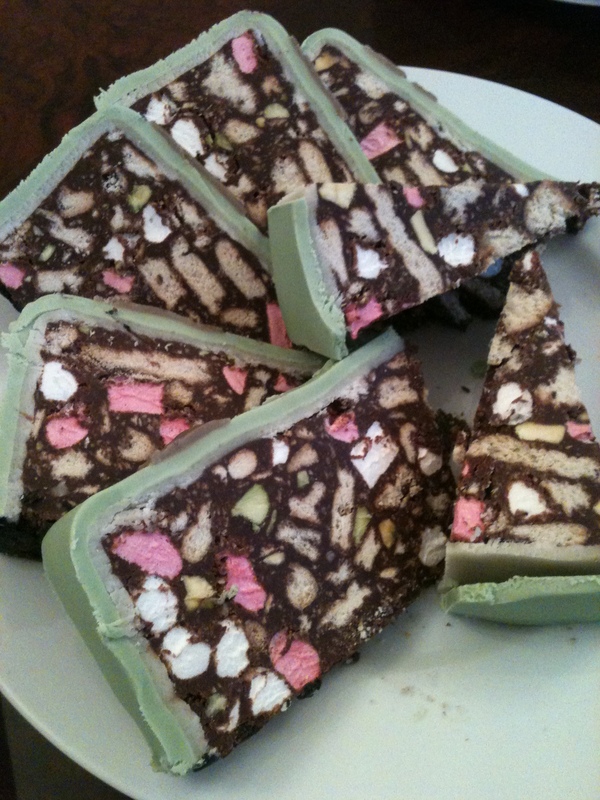 I made the middle layer – a biscuit cake which was more similar to rocky road. The verdict was, that out of the two we made, this was the best/most suitable. Her wedding cake won’t be covered in green icing like this one was, and I wouldn’t usually cover a chocolate biscuit cake with icing, but the green went perfectly with the pistachios in the cake and it looked really pretty when cut. There are a few changes that I’d make – maybe change the type of biscuit, amount/type of chocolate – but as a base cake it was pretty good. The recipe was from Peggy Porschen’s Boutique Baking and she mentions that it’s very popular with her customers. I can see why! Line a 20cm square tin with greaseproof paper. Place the butter, chocolate and golden syrup in a bowl and melt gently in the microwave. In a separate bowl mix the remaining ingredients. Add to the melted chocolate mixture and stir well until fully combined. Pour into the tin and spread it out evenly, Leave to chill in the fridge until set. Take out the tin, cut into slices and eat! thanks! I’ve had a look at the links – I love the look of the second one and might have to add it to my ever growing list of recipes to try! Hi, that looks & sounds delicious! Can I ask, does decorating it with fondant icing differ at all from a ‘normal’ maderia or sponge cake? How long does it last once decorated? I covered it in icing in the same way that I would do a normal sponge cake – if anything it was easier because the cake was solid! The recipe says it will last 2 weeks, but I think it kept much longer than that. Hi, I’ve been asked to make a fridge cake wedding cake next year. Have you made your Sister’s wedding cake yet? How did it go? and was it stacked? I’m thinking through the process of a 3 tiered stacked cake covered in ganache and possibly chocolate cigerellos. Will likely have plenty of trial runs!! I haven’t made her cake yet – its now less than 2 weeks until the wedding though! Chocolate biscuit cake is solid so stacks really well and there’s no need to add extra support – this recipe is really good and not too sickly sweet. I’ll be blogging about the cake after it’s done so if you want to see how it goes then come back in a few weeks – good luck with yours!